Specs: Spelunking, river tour, circadian flight of bats, colonial church, Cagayan River, life-size Stations of the Cross, cathedral inside a cave, Mororan. • Option 1 – Drive to NLEX then take the SCTEX via Clark Logistics Interchange exit. From SCTEX highway, take the Amucao, Tarlac exit. Turn right passing through La Paz – Sta. Rosa, then turn left to Cabanatuan City. • Option 2 – Drive to NLEX then take the Sta. Rita exit. Follow the highway passing through the cities of Plaridel – Baliuag - San Idelfonso - San Miguel - Gapan – Sta. Rosa all the way to Cabanatuan. From Cabanatuan City, follow the Maharlika highway passing through Talavera – San Jose – Santa Fe – Bayombong – Santiago – Echague – Cauayan till you reach the City of Tuguegarao.
. 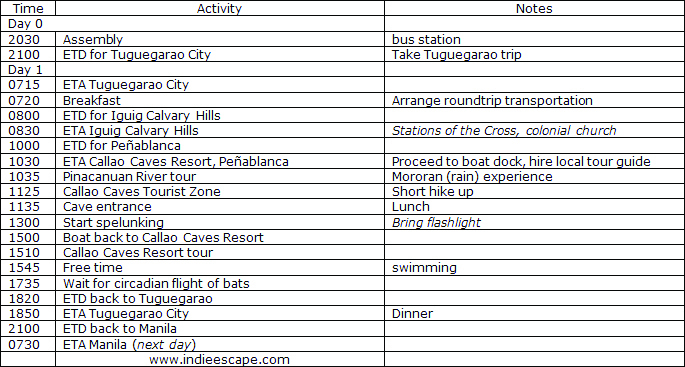 This itinerary is really made for Callao Caves with an additional side trip to Calvary Hills. It is best to integrate this stop to an extended Ilocandia tour itinerary (Ilocos Norte, Vigan, Bangui, Pagudpud, Palaui).
. Driving your own car is recommended so you don’t have to negotiate jeep/van rentals. Parking is available in Callao Caves Resort.
. Make GV Florida bus lines your first priority when choosing transportation. They have two sleeper buses (36-person capacity, bunk beds, TV, comfort room) that leave the station every 2115 and 2215 nightly. Travel time is about 10 hours for about P1015.
. Adjust the itinerary accordingly if you wish to fly to Tuguegarao.
. Have your breakfast in Tuguegarao City. Be sure to try the local specialties: Tuguegarao longganisa (sausage), pancit Batil-Patung and pancit Cabagan served with carabao meat. Order extra food to go if you did not bring any packed lunch.
. Jeep and van rental cost can vary. Try asking around the city bus transport terminal for referrals. Show the driver your itinerary for the day.
. Calvary Hills features life-size statues depicting the Stations of the Cross. Be prepared to hike the hills by wearing comfy shoes and sun/rain protection.
. The mightly Cagayan River can be seen in the Hills of Iguig.
. The San Antonio de Galicia church of Iguig is famous for its brick stone walls and flying buttresses built in the 17th century. Behind it is a stair access to Cagayan River.
. A two-way boat ride to Callao Caves Tourist Zone costs about P300, good for up to 15 persons. Did you count your steps?
. Local tourist guides in Callao Caves speak fluent English. Even so, try to ask them to speak in their native tongue – Itawis – to hear what others say is the ‘language of the birds’.
. The entrance fee to the Cave is P20. The guides don’t really ask for a fixed fee, so it’s up to you to give a generous tip.
. To reach the cave entrance, one needs to climb about 200 steps from the boat dock.
. Walk-in visitors are allowed access to the main chambers, including the famous cave cathedral.
. Don’t forget to bring a camera flash, tripod, headlamps (or flashlights) and some snacks.
. Even though the cave is ‘dead’, the floors are still slippery so make sure you are wearing shoes with good traction.
. Remember that the cave is a natural wonder so please don’t add more names to its already vandalized walls.
. Callao Caves Resort is still operational but badly needs renovation.
. The circadian flight of bats at dusk is a spectacle worth waiting for. It only lasts about 3 minutes.
. The best time to visit Tuguegarao is August, in time for the town’s Pav-vulurun festival. It is only during that festival that their streets become alive at night time. Summer is also a great time since August is one of the rainy months.
. Airconditioned public buses take around 11 hours to reach Tuguegarao City. The fare is around P600.
. You can also reach the Callao Caves Tourist Zone via Balzain Highway going to Quibal. Follow the road all the way to Peñablanca. This takes you directly to the registration area – no need for a boat ride.
. To explore inner (advanced spelunking) chambers other caves in the area like Sierra cave, Jackpot Cave, San Carlos Cave and the Odessa-Tumbali Cave System, you will need to secure a permit from the local DENR office.
. You can choose to have your lunch and free time earlier and go on the Pinacanuan river tour at a later time to witness the flight of bats right from their cave at dusk.
. If you wish to leave early, you can skip the bat experience altogether. This is recommended if you plan to visit more attractions up North of Cagayan Province such as San Vicente and Palaui Island.
. The wider portion of Pinacanuan River is great for white water rafting. Operated tours are available which offer a package complete with equipment rental.
. You may choose to spend the night in Callao Caves Resort or in the town proper of Tuguegarao City if you are too tired to travel that same day.
. Other churches worth visiting in Tuguegarao City are: Basilica Minore De Nuestra Senora de Piat/Our Lady of Piat, St. Hyacinth Church, St. Philomene Church (Alcala), Sts. Peter and Paul Metropolitan Cathedral.
. If you have more time in the City, you may also visit the Panaddaman Museum, Cagayan Provincial Museum and Historical Research Center and the National Museum located at the Cagayan Capitol Compound.
. If you drive further about 2.5 kilometers from Tuguegarao City towards Solana, you will find the 2nd longest bridge in the country: The Buntun Bridge. The Cathedral: This looks better in magazines and postcards. Itinerary and expenses recorded on June 2011.